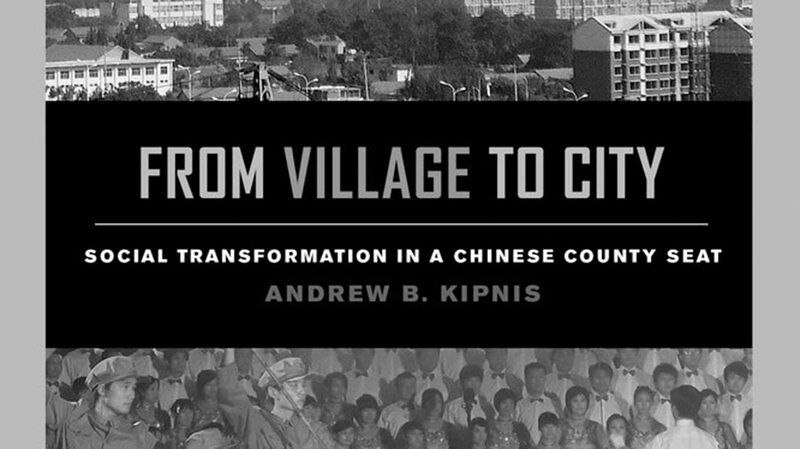 Andrew Kipnis’ new book, From Village to City: Social Transformation in Chinese County Seat (University of California Press, 2016), paints an extraordinary portrait of Zouping, a county in Shandong province, challenging our current understandings of modernity and putting forward a new theory of urbanisation. We spoke with the author. Why did you choose to study Zouping? ANDREW KIPNIS: I originally went to Zouping county in 1988 when I was a PhD student, before I had even decided exactly what project I would complete for my PhD degree. I had just finished my preliminary exams and was studying Chinese at Nanjing University, when one of my PhD supervisors was given an opportunity to do a project in a village in Zouping county and invited me to tag along as research assistant. At that time, Zouping had been selected by Chinese officials as a county where American social scientists could do research, so I did not really choose the place, it was my only option. But since I started doing research there, I established relationships with many people and found the research environment good. My discussions with researchers working in other parts of the country led me to conclude that, though Zouping was a place that had been approved by the Chinese government for researchers, it was not terribly different from many other parts of the country. Over the years, as I have read about and visited many other parts of China, I gained a firm grasp on the ways in which Zouping differs from and resembles other places. After my dissertation research, I continued to return to Zouping as often as I could. From 1999 onwards, most of my time was spent in the county seat. I observed the rapid urbanisation that took place there and thought that I should write a book about it. How do places like Zouping challenge our current understandings of modernity? AK: The term modernity means different things to different theorists. In the book, I summarise theories of modernity by grouping them into three types. The first is classical theories, which portray modernity as an all-encompassing historical rupture that occurs when predominantly agricultural societies urbanise and industrialise. Next comes second-wave theories, which observe shifts that occur after industrialisation and urbanisation in Europe, and posit ever newer ‘modernities’ to go with these changes. Third are cyclical theories of modernity, which postulate that any place in the world where capital is accumulating will feel modern, that features of modernity, like a belief in progress and planning, move from place to place as capital shifts around the world. In the discipline of anthropology, most theorists abandoned the concept of modernity because debates over the term had become too convoluted and criticisms of the expression too numerous. But in observing Zouping’s relatively simultaneous industrialisation, urbanisation, demographic transition, consumer revolution, and increases in educational and bureaucratic structures, I felt drawn by the term’s comparative strengths. While I agreed with many of the criticisms, I felt that classic modernisation theory especially raised important questions for understanding Zouping’s social transformations. So I strived to develop a theory of modernisation that addressed some of the criticisms without abandoning the term altogether. Within anthropology, many theorists simply did not discuss places like Zouping, which were undergoing many of the social transformations associated with a classic modernisation. In the field of China studies, most of the literature on urbanisation focuses on the Pearl River Delta, Shanghai, and Beijing. But Shanghai and Beijing, like the other major cities in China, are de-industrialising, and the Pearl River Delta urbanised and industrialised in a relatively peculiar manner—it relied primarily on foreign capital and workers from other provinces while the local rural population became a privileged rentier class. In Zouping, there was the combination of industrialisation, primarily local capital, and a local rural population that became a proletariat. This type of urbanisation has not received the attention that it deserves. In the introduction, you quote from Marcel Proust’s Recherche. What does Proust have to tell us about a Chinese rural county today? AK: Quoting Proust is one of the ways in which I bring the literature on classic modernisation into the discussion. Proust wrote about a time when the social transformations associated with industrialisation and urbanisation in France were proceeding rapidly. He focused on the topic of memory in relation to these transformations. I wanted to raise the topic of memory because it is an important aspect of social transformation. What are the social and psychological functions of memory in a place undergoing rapid technological, social, and economic change? In the particular passage I quote, Proust links memory to both the psychological construction of one’s ego and the place of concrete technologies from the past in the process of constructing the ego. In the book, I raise questions about the place of nostalgia for bygone technologies and modes of life among Zouping’s residents. One of the central concepts that you introduce in the book is that of ‘recombinant’ urbanisation. What do you mean by that? AK: My use of the word recombinant is a way of emphasising a central fact about all forms of transformation—that transformation includes the recycling and recombination of existing parts of a given entity, along with the integration of new items. Too often, classic theories of modernity wrote about social transformations as if they were acts of replacement instead of transformation. Instead of saying that industrial/urban society was built out of bits and pieces of rural/agricultural society, they tended to rely on tropes of complete contrast which implied that industrial/urban society was completely different to the past societies out of which it developed. Just think of the children’s toy—the Transformers. You can transform them from a human-like robot into a car, truck or airplane by twisting the individual bits. A proper transformation requires the coordinated shifting of all of the original pieces. But no part is simply replaced by something else and many of the properties of the transformed entity are still marked by their original form. Now the analogy of the toy has its limit. With the toy there are no new pieces incorporated from the outside and the entire process is consciously guided by the person playing with the toy. But still, this is a better understanding of social transformation than one that implies the simple replacement of one thing by another. My interest in memory—individual, social, and political—relates to my interest in processes of social transformation. Memory is one of the ways in which slices of the past are recombined to construct the present.